I’m always looking for good brunch ideas, so when I saw one that involved puff pastry and hard boiled eggs, I thought I’d give it a try. Then I looked at the ingredients of the puff pastry and though better. In my quest for a lower calorie recipe to replace the puff pastry, I saw the suggestion to try Phyllo (Fillo) dough. It’s not as robust, so it tends to flake and crumble more easily than puff pastry, but for me, it’s a great alternative to puff pastry. It’s a much lower calorie option, but still have a delightful flaky texture and can be moulded around your food. For me, this was definitely a brunch sandwich. It works perfectly if I don’t get around to eating breakfast until mid morning. I love the tender crunch of the dough as I bite into the sandwich. But be warned – it’s not a neat and tidy sandwich to eat. But it’s delicious enough that it’s totally worth the mess! 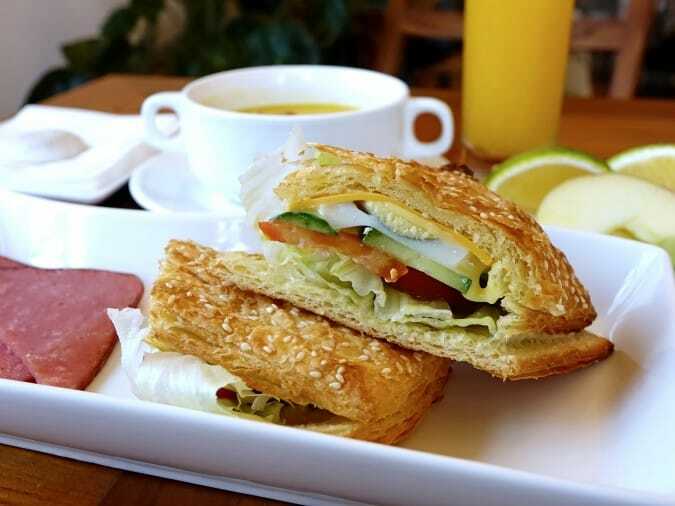 A delicious brunch sandwich with a hard boiled egg wrapped up in tender and flaky phyllo dough. It's perfect for a brunch, a snack or even made as a slider for appetizers! Place one sheet of dough on a pan lined with parchment paper. Top with 3 more sheets of dough, continuing the process. Brush the top sheet with the egg wash, then sprinkle on the sesame seeds. Repeat with the other 4 sections of dough. Slice the eggs, tomato and cucumber. Gently slice the phyllo packets in half. Spread on the honey mustard and fill with the egg, cheese, tomato, lettuce and cucumber.